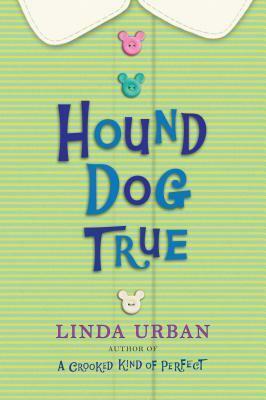 Margie’s Review: I truly wish that I had been able to read Hound Dog True as a child. Linda Urban’s writing is sweet and refreshing, heartfelt and insightful – a book for all ages to read, experience and be inspired by. Mattie has one week to adjust before becoming the new kid in school again. She decides that maybe this time it won’t be so bad if she can convince her Uncle Potluck, the custodian to her school, to let her become his apprentice in order to avoid any moments to where she would have to be forced to talk to her classmates. She is very observant and records all of their odd jobs in her notebook. Then the neighbors niece comes into town for the week. Mattie’s mother and Uncle would like them to be friends. But Mattie is awkward and doesn’t know what to do with Quincy who looks to be older and outspoken, the complete opposite of what Mattie is. Will Mattie be able to trust Quincy to be her friend? Mattie’s mother, although very loving and caring, is flighty and in denial. Her motto being “When the going gets tough, the tough get going.” After getting some advice from Uncle Potluck, she decides that it is finally time for her and Mattie to stay put for once. That they weren’t going to run anymore ‘when the going gets tough’… Mattie doesn’t agree at first. She is having a tough time adjusting and wants to get going… will they? Will Mattie stay “Hound Dog True”? It is a coming of age story of a painfully shy girl; a fifth grader who overcomes some of her fears by accepting what is, opening up and accepting how good things can be if she allows herself the opportunity. I truly recommend reading this book! “On New Year’s Eve, I write down all the things I want to happen in the year upcoming and then I stick the list behind my mirror. And guess what? For the past few years, most of those things have happened. Now, my rational side says that this is because every time I look in that mirror, my subconscious is reminded of what it is I want and encourages me to work all the harder to get it. Book Summary: You think your school’s scary? Ms. Fang, an 850-year-old vampire! Dr. Dragonbreath, who just might eat you before recess! Mr. Snakeskin—science class is so much more fun when it’s taught by someone who’s half zombie! Plus, Gargoyles, goblins, and Frankenstein’s monster on the loose! The world’s most frighteningly delicious school lunch! And, the narrator’s an eleven-year-old ghost! Margie’s Review: All middle grade readers will definitely love this new series! Such a fun and quirky book that starts with us meeting our narrator, Derek the Ghost. We get to know a little about Derek and how/why he is a ghost… and then he introduces us to what we will find and who we will meet at Scary School. In my opinion, this book was more of an introduction to the series than actual story telling. Every chapter is dedicated to a different teacher or student, giving us their story and background – if it wasn’t for the fact that Derek the Ghost reminds you of the underlying story that he’s trying to tell you, it felt like I was reading a bunch of short stories. Because of this, it was a bit hard to get into at first, but with the help of the illustrations at the beginning of each chapter, it started to flow easily and was a lot of fun. 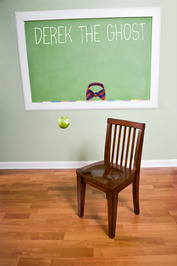 And here is some exciting news! Derek the Ghost is hard at work and writing up a storm! The next book will also be released as a hardcover on June 26th, 2012… Scary School #2: Monsters on the March. There is no official blurbs/quotes for it yet. But I’m pretty confident that it is going to be a good, laugh-out-loud story for the kiddos 🙂 Keep an eye out for it! About the author: Derek the Ghost is an eleven-year-old ghost who haunts the classrooms and hallways of Scary School writing down all the spine-tingling, often hilarious things that go on there. Despite his ghostly state, Derek still enjoys reading comic books and hopes to one day become a master ninja. If that doesn’t work out, he will continue to share the fun of this very special, very secret school, so all kids can experience the scariest school on Earth. 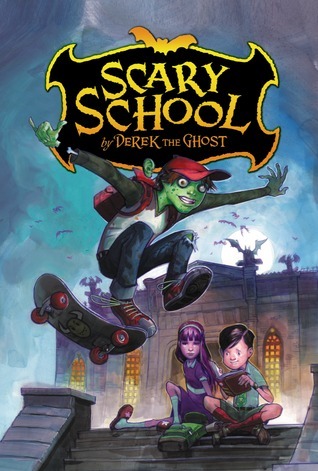 Find more about Derek the Ghost on Scary School’s Official Website, Facebook, Twitter and Goodreads.